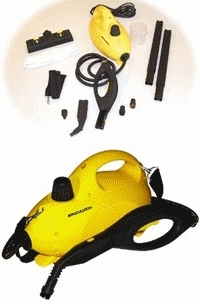 The Mcculloch Steam Cleaner is a great steam cleaner that is available in different types including portable/ hand held, canister and heavy duty. 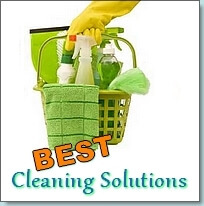 These cleaners are well known for their performance and of course, affordability. In the portable/handheld category there is the McCulloch MC1230, the McCulloch MC1226 steam cleaner and the McCulloch MC1246. In the canister type we have the McCulloch MC-1275, the McCulloch MC1375 and the McCulloch MC1385 Deluxe which falls under the heavy duty category. In this article we shall cover the handheld cleaners and will discuss the other McCulloch steam cleaners other articles. The McCulloch Mc1230 1300-watt handheld steamer is a handy handheld all purpose steam cleaner for indoor and outdoor use. It has a 3 minute heat up time and will steam continuously for 10 minutes making it perfect for quick but powerful cleaning tasks. It has 11 handy useful accessories. The steam trigger can be locked in place to supply continuous steam and free up your hand for wiping or scraping. The 34” extension hose attachment makes it possible to reach into hard to reach nooks and crannies. What do Consumers have to say about this machine? The biggest complaint consumers had is that the steam pressure runs out way too quickly and waiting for it to build up again is frustrating. 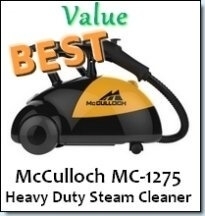 The McCulloch Mc 1230 Handheld Steam Cleaner is a great steamer but keep in mind that this is a small machine meant for small tasks that can be easily stored because it is so compact. It works at its best if you release a short burst of steam, wipe the dirt away and then release another short burst of steam followed by more wiping. It is very versatile when used like that and does well cleaning a variety of things. A small percentage of consumers reported that the extension hose started to leak after a few uses. It is unclear whether they received defective parts or if they didn’t follow the instructions and caused the problem themselves. You don’t need to use a funnel to fill this baby as the hole where you fill it with water is conveniently recessed. Most consumers reported being happy with it when taking care of small cleaning tasks but would rather use a canister type steam cleaner with bigger capacity for more serious cleaning. 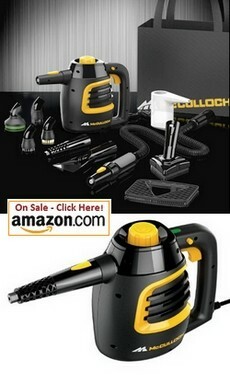 This is a lightweight hand held steam cleaner that is meant for small cleaning jobs. Its ideal use includes cleaning areas which need a concentrated force of steam like engines, wheels and other hard to reach places. It is particularly best suited to automobile related jobs. This handheld steamer is capable of 8 minutes steaming time with a 6 oz. water reservoir. The unit weighs about 3 lbs and the steam temperature ranges between 60-220ºC. The accessories include a steam jet nozzle, large nozzle, utility brushes (brass, short nylon and long nylon), squeegee, cloth cover and measuring cup. 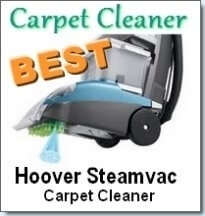 This little steamer boasts a 900 Watt heating system as well as a 12 ½ foot power cord. 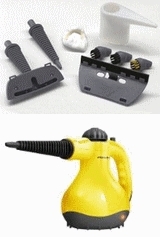 This portable steamer is able to quickly remove dirt and grime from almost any surface. It packs 1500 Watts and at $88 it certainly isn’t an expensive steamer. It takes about 6 minutes to fully heat up but with a tank that can hold 33 oz. of water, it provides 50 minutes of uninterrupted steaming time. This cleaner is perfect for cleaning counter tops, tile floors, grills, car engines, ovens and much more. • Some report that the steam isn’t hot enough. 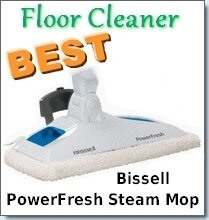 Overall, this is a great little steamer that is a good choice for your first steam cleaner. However, this is not meant for big or heavy duty jobs, so don’t expect that kind of performance.